As promised I have prepared a tutorial for the Pieced Scrap Border Quilt that I started working on last week. Not for one moment would I suggest that this is my original design. This quilt is made from two square blocks that alternate. One block is a pieced block and the other is a solid blocks. The pieced block is no more than a square center that has been given a pieced border. 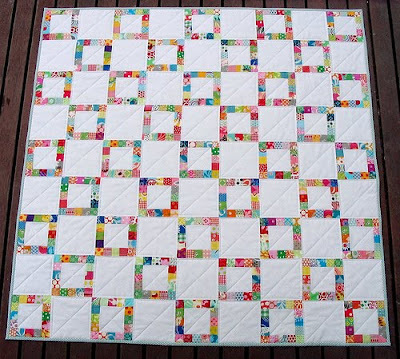 Pieced borders made from small squares, such as in this design, have been added to quilts for many many years, the only difference here is that the pieced border has been added to each alternate block rather than the finished quilt. 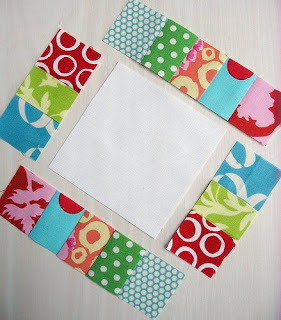 My inspiration for this pieced border block came from the border in this flickr image. What follows is a step by step tutorial to make your own Pieced Border Scrap Quilt , a great scrap buster quilt and a fabulous way to celebrate the October Scrap Buster Contest at Sew, Mama Sew! From cotton scrap fabric rotary cut pieces measuring 1 1/2 inches wide by 5 1/2 inches long. For a great overall scrappy look I would suggest you might need 20 plus different fabrics in a range of bright colors. You will need a total of 224 strips. 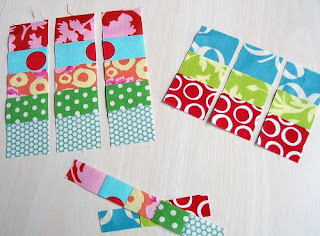 Using a 1/4 inch foot, sew together strips into sets of 3 and 5 strip blocks as shown above. Mix colors/fabrics together at random. You will need 28 sets of each strips set. That is 28 5-strip and 28 3-strip sets. Press seams to one side. The only seams that are important in terms of direction are the outer seams of the 5 strip set - press in towards the center of the block. This will become obvious when sewing the block together. Cross-cut each strip set at 1 1/2 inch intervals. Discard the remainder. You should easily be able to cross-cut in to three separate pieced strips. You will now have a total of 84 strips of each pieced strip. Cut a 3 1/2 inch center square from a solid fabric*. I have used Robert Kaufman Kona Cotton in white. 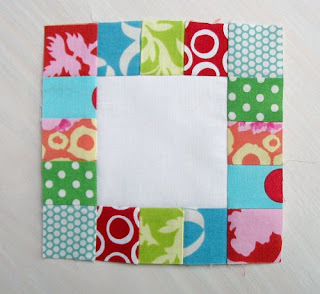 Sew two of the small strips to each side of the center square as shown in this picture. Easy! Press seams out towards the printed fabrics. 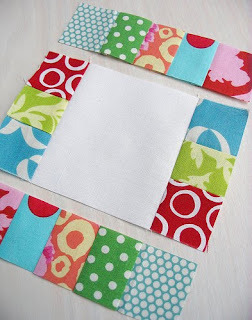 Sew the longer (5 pieced strips) to the remaining sides of the center square. Press seams out towards the colored fabrics once again. This ensures that no seams are visible in the white solid center square of the block. And your pieced scrap border block is finished. The finished block should now measure 5 1/2 inches, which includes your seam allowances. You will have enough strips to complete 41 pieced blocks. 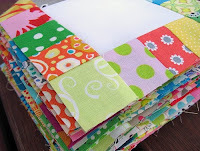 Once you have pieced 41 blocks you will need to cut 40 squares from a solid fabric each measuring 5 1/2 inches. A total of 81 blocks are required to make this quilt as pictured. 41 pieced blocks and 40 solid blocks. Lay out your blocks according to the finished quilt as above. I ensured that each outer corner of the quilt had a pieced block rather than a solid white block. Sew blocks in each row together. Then sew rows together. The finished quilt top will measure 45.5 inches x 45.5 inches. 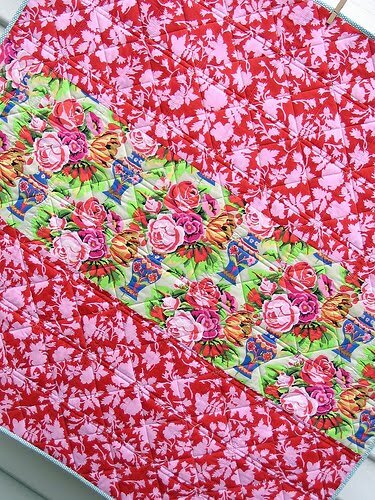 I prepared my backing using two pieces of Kaffe Fassett fabric. They are Silhouette Rose and Kirman which complement each other beautifully. It is quilted it with my favorite and preferred style of straight line quilting. I first outlined all the blocks by stitching just 1/4 of an inch on either side of the block seams. I then cross-hatched through all of the blocks. And added binding using one of my favorite binding fabrics by Marcus Brothers. This is Aunt Grace - Polka Dots in blue by Judi Rothermel. And of course, just in case you think it would be easier to get someone else to make a quilt just like this for you, my quilt is for sale in my Etsy Store. SOLD. Feel free to ask any question regarding the tutorial or quilt by leaving a comment or email me. *You will need a total of 1.5 yards of solid fabric to make the number of blocks required for this quilt. That's a very striking quilt, great use of scraps. Thanks for providing the tutorial. Thank you for sharing your beautiful quilts with us, and for the very clear tutorial. Each and every one of the quilts you make is exactly the style I am shooting for as a very new quilter. I just love visiting your blog and seeing the beautiful pictures! Beautiful quilt! Thanks for the tutorial...maybe someday! I am totally in love with that quilt, and the whole idea. Definitely bookmarking this one for future use! 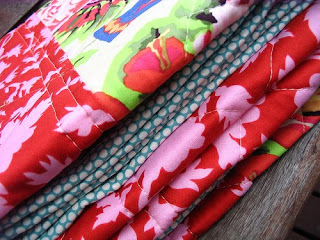 Great use of scraps to create such a modern, fresh quilt with lots of breathing room. i love this!! but what if i don't have that many different fabrics to use? do you think it would still work with fewer varieties of scraps? such a gorgeous quilt, simple yet interesting. Thanks for sharing the tutorial. Just gorgeous!! Love the quilt and thank you for posting the tutorial! Looking forward to giving it a go. 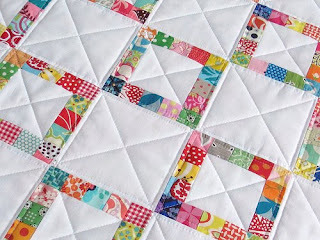 The quilt is so lovely and the tutorial is perfect. Thank you for putting it together. And such a great use of scraps. Wow, it's amazing how off a person can be about the size of things we see in photos....I thought for sure the finished squares were larger and it is even more impressive knowing they are 5"!! You are beyond generous to take the time to make this tutorial. Thank you so much -- AND for all the inspiration I continue to get from your quilts and blog. You never disappoint! BEAUTIFUL I just love your work and thanks for the great info. this is the second one today that has tought me alot.Thanks for sharing with us. Thanks for the tutorial :) I love how clean this quilt looks with all the white. The back is gorgeous too. Great tutorial Rita ... thanks. Absolutely beautiful quilt. I love scrap quilts and I really love your tutorial. Can't wait to make a quilt with your insights. Absolutely stunning and wonderful tutorial. Thank you Rita....I'll have to add that on the ever growing list of quilts I'd like to make. Well done. I love this quilt. What a great tutorial too. I'll have to link to it the next time I blog. Thanks for sharing. I have many scraps and now I know what to do with them. Yes, but you see, yous is always BY FAR superior to any inspirations they came from. What a knack you have. I am in awe. It's a terrific quilt and the backing is gorgeous. Thanks for the time in doing the tutorial. I especially love the scrappy quilts. We all are inspired by lots of different sources, and then we come up with our own version! Thanks for sharing yours! What a great tutorial - your instructions are very clear, I love the way you use the photos as a step-by-step process. Well done! oh I love it! I wish I didnt have to go to work today...I already have in mind the fabrics I want to use! thanks for the share! LOVE your quilts and your style. Ohmygosh -- you're finished already! You're amazing -- it's beautiful!!! Lovely, lovely quilt! I just love this clean fresh look! Thank you for a great tutorial! Great tutorial!!! Thanks for sharing. I also like your method of quilting. De-lurking to say that I love this design... and it looks so easy even I can do it. Yay! This tutorial has been bookmarked!!!! I think my fav part is the binding... fun dots! Thank you very much, Rita!!! Beautiful quilt! Thanks so much for the tutorial! So sweet. Thanks for the tutorial. I know I am sooooo dramatic, but really you are amazing. I love everything you touch, sew, quilt, create, make. thank you. By crikey lady you've done it again! What a beautiful, fresh looking quilt. I love that the front is so simple and then the back is so zingy! Going straight to the "favourites" book mark! THANK YOU Rita!!! Now I know how to get all the squares done without cutting and piecing all week! Thank you a million zillion times for sharing this tutorial. The quilt is indeed amazing, as yours always are! I love your use of colour and though i'm new at this i've noticed we share some favourites: amy butler and kaffee fasset!!! greetings from your number 1 portuguese fan!!! What an idiot I am!!! I just tried to subscribe to your blog and found I'm already a subscriber! Do you think maybe I've got too many subscriptions?! What a cute original idea. Nice job and great tute. question - b/c I've just started quilting on my Bernina.. I just started recently stitching in the ditch using my walking foot... when you start and stop what do you do? stitch in place a few times then lift the needle and move? then anchor again??? do you leave a long thread to later burry? or do you cut it off? I'd love to get more machine quilting tips from another Bernina user. thanks! WoW You are the best tutor on the BLOC! love this - i saw it in your flickr and am so happy you wrote a tutorial! It reminds me of a version over at film in the fridge - which I loved too! beautiful. I love this quilt! I have no time to start a new project, but I think I'll have to make one of these anyway! simple... but so beautiful!! great tutorial! Thank-you so much for post this - I can now add this to my ever expanding list of things I want to make. Love the colours! I've made several blocks of the framed squares and I love them. My friends can't wait to see it all finished. thanks for the tute and I'll let you know when its done! 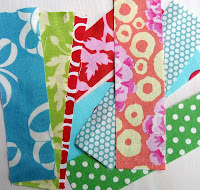 Thanks for such a great tutorial and congrats on being a grand prize winner at Sew Mamma Sew! Wow. What a beautiful quilt tutorial. It's now on my list of things to do someday! I'm a beginner and have just finished a table runner for a friend. I have started searching through my scraps and will attempt to make the beautiful quilt following your tutorial.Thanks so much.Have a good year ahead. I so have to try this!!! thank you for such a wonderful tutorial! I finished one! Thanks for the tutorial. It is my favorite quilt I have done so far. I've only made 4, but still! I started this quilt yesterday, it is so fun to work on - I can't wait to complete it, and hope that it looks as sharp as the one pictured! I love this quilt. Scrappy quilts are awesome. Can't wait to give this one a go. Thanks for the tutorial! Thank you for this! I need scrap busters. Loved the tutorial and the idea!!! I love this and can't wait to try it. Love your blog! Merry Christmas from North Carolina! I LOVE this quilt! I can't wait to make it using my stash:) Thanks for the tutorial. 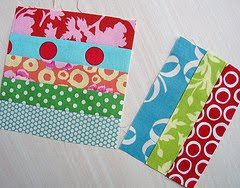 Oh this is a great idea for use of the scraps and the stash.............thanks for the easy peasy tutorial. I just finished a quilt with 1930's fabrics and had a bunch of 1 1/2" strips left over. Now I have a plan for the left overs. Thanks for the tute! I've started my quilt like this, only instead of strip piecing, each little square is 1.5" because that is the smallest scrap I save. I'm loving it. Thanks for the tutorial. I made a couple of sample blocks and they are 5" not 5 1/2" . Everything lines up but what did I do wrong? The block should measure 5 1/2 inches square when you are finished. The finished center square should measure 3 inches x 3 inches and the width of the borders 1.25 inches on both sides of the center square. That definitely = 5 1/2 inches. What measurements do you have? Thank you for the reply. I made two blocks that are both 5" square. The finished white square is 2 3/4". The patched border is 1 1/4". I'm going to try it again. I'm working on a loaner sewing machine - checking the seam guide....it's set at 1/4". Ya know, I can just go with it - shrugging shoulders in a quandary. Oh my, I'm so glad that I found your blog. It's fabulous! This would make an excellent group quilt as well - each person could do one pieced block and write their name and date in the center with permanent ink. I am going to make this for sure. I love it, and it looks so easy.